With the whole family down in Louisville, KY, last weekend for Matt's Ironman, we got to sample some kicker cuisine in that hopping town. Jack Fry's, an iconic Louisville spot, had the most interesting appetizers I've come across in a long time. 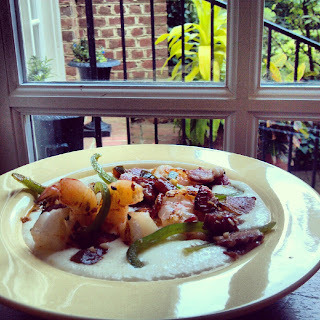 Three things on the menu caused me to fall silent, the restaurant chatter fading away, as I thought about these unlikely combinations: Shrimp and grits with country ham, red-eye gravy, shiitakes and tomatoes. Pork belly with watermelon, watermelon radish, cantaloupe coulis and fried leeks. And foie gras with country ham, johnny cake and elderberry and blackberry preserves. It's worth a road trip from Columbus for that trifecta alone. I subbed in a few chunks of crisped applewood bacon for the country ham. No red-eye gravy handy, but I really didn't miss it. Other than that, it's pretty much what we had. Dice the bacon into chunks and fry until fairly crisp. Drain bacon onto paper towels. In separate frying pan, heat 1 tablespoon olive oil and sauté the veggies with the garlic. Steam the shrimp OR sauté them in a touch of olive oil. While that's happening, make the grits, two servings-worth, according to package directions. Add the butter and a touch of heavy cream. I also put a tiny bit of crème fraiche in, and it was awesome. But, again, rich. You can cut back on these additions...just taste as you go. The grits at Jack Fry's were super creamy, almost like mashed potatoes with lots of butter. Season the grits with salt and pepper to taste (I used a wonderful smoked sea salt). Put the grits in two large bowls, divide and scatter the shrimp, veggies and bacon artfully over the grits. Serve immediately.